Helen Wilson has written many articles on person centred planning and inclusive practice. Please contact Envision if you are seeking information about any topic mentioned on this website. In 2002, whilst working at Edinburgh Development Group, Helen was involved in a developmental project, funded by the City of Edinburgh Social Work Department, to undertake a programme of training in person centred working with staff in four units supporting older people in residential and day care. The report is a narrative account of that training programme and the effects it had on the staff and the people who live in and use those units. The report draws mainly on participants' training evaluations, direct feedback during and after the course and individual interviews following the training programme. Click here to download a copy as a PDF file. 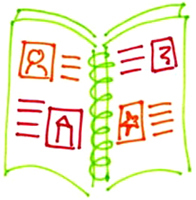 Published in 2006, this booklet focuses on the complex process of support planning with people who use human services. This booklet has been written to help staff and people who use services negotiate some of the trickier aspects of support planning and avoid some of the common pitfalls: what to include, how to compile it and how to make sure that the support plan serves its purpose of helping the person to get the life and the service they want. Helen draws on her experience of working directly with adults with learning difficulties, disabled people and older people, supporting them to put together person centred plans and person centred support plans, as well as her experience in training and mentoring staff working in a variety of social care settings to develop plans with individuals. Price: £15 including post and packing, available from Envision. If your organisation would be interested in obtaining multiple copies of this publication, please contact Envision to discuss buying a licence which would enable you to print them yourself. Revised and updated in 2008, this publication gives an introduction to graphic recording and facilitation and contains lots of practical tips for getting started. With a section of sample graphics that Helen has produced, followed by almost 20 pages of images to copy and practice, this is a great starting point for anyone wishing to build up their own graphics repertoire and add to their facilitation toolkit. Price: £20 including post and packing, available from Envision. "Quite simply, the best training manual I have ever seen. Fantastic content, easy to follow and the graphics are brilliant!" You can buy single copies of this pack for £80 (+£5 post & packing) each. Alternatively, Envision can deliver in-house training for trainers on how to work through the materials in the pack with groups of self-advocates and service users to work through the materials in the pack. The pack has as accompanying CD-Rom with all the training handouts in Word format. Please contact Envision for further details or for an extract from the training manual. Helen is producing a CD-Rom of over 200 useful everyday graphics. They are formatted as jpegs which can be imported into any of your documents or printed separately as images.